LIQUID SOUND is a contemporary bathing experience for relaxation and inspiration. The water becomes a stage for music events which stimulate the senses, inspire the imagination and motivate a return to natural rhythms. Listening and relaxing, floating weightlessly in a sensuous waterworld, eyes open or closed, there is nothing to do but to do nothing. The experience offers a dolphin-like lightness to the seeker of health and gives substance to the popular quest for multimedia-entertainment. Bathing in light and music invites into an »inner journey« that counterbalances the stress of everyday life. LIQUID SOUND® is a branded concept and a nucleus of a new concept of bathing, one in which multimedia-design, Spa architecture and culture are matched to complement one another. It is also a computer-controlled multimedia system for the coordinated deployment of light, sound and video above and below the water’s surface. 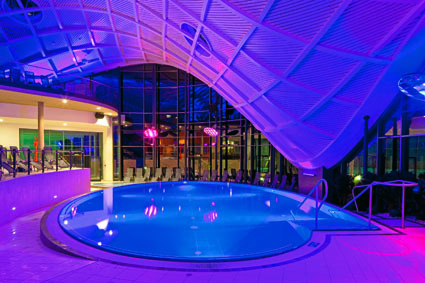 LIQUID SOUND has achieved international recognition through Spa installations at Toskana Therme Bad Sulza, Toskana Therme Schandau and Toskana Therme Bad Orb. In these locations, often described as “water-filled concert halls”, LIQUID SOUND developer Micky Remann acts as the cultural director. The concept combines wellness, art and entertainment. Associations with the magical lure of water are as much part as the innovative appeal of high-tech and multimedia art. Special events like full moon live concerts, Liquid Sound Club nights and festivals take place in these thermal baths that are particularly popular with people who participate in contemporary culture and spirit. The label Lemongrassmusic presents the unique compilation „Liquid Sound Vol.3“ on CD and for digital download. For the musical part a true expert was assigned. Without any doubt DJ Nartak with his projects “Klassik Lounge Nightflight”, “Groove on, Earth!” and “Globality” belongs to a small group of leading figures in the international Downtempo scene. Well known for 20 years of DJing and an impressive list of compilation releases, he is also the founder of Jubilee Records, Abstrait Music and Free Form Records. In 2002 his collaboration with Liquid Sound and Micky Remann took shape by founding “Liquid Sound Music” – the platform for the legendary “Liquid Sound Vol.01″ which became a classic of the Ambient & Chillout scene. What was important for you while selecting tracks for “Liquid Sound Vol.03″? From the beginning I had this vision of creating a homogeneous musical journey, which would carry the vibes of Liquid Sound’s bathing and relaxation experience. At the same time it should also work for “dry listening” at home.My intention was not only to create a deep relaxing ambiental selection, I also wanted to show the different expressions water can have: sparkling, shimmering, powerful and free flowing This may sound like a conflict but it was the challenge I wanted to take on. I wanted the mix to lead the listener & floater carefully towards silence and letting go, at the same time offering inspiring musical impulses from different genres and musical sources. To bring this vision to life I received support from a wide and various bunch of artists and producers from all over the planet, whose contributions not only reflect their individual and cultural roots, but also – probably without them being aware of it – the sounds of water from their own local neighborhood. “Mirage of deep”, for instance, are from Spain, the “Aquarelsingers” are from Russia, “Caban” from Mexico, “Bahramji” is a Persian Sufi and the “Laya Project” comes from India. Are there any tracks on the compilation which are specially important to you? To me, each and every tune and track on “Liquid Sound Vol.03″ is a highlight, because they are all pieces of the puzzle which complete the resulting sound. My highest respect to all artists and labels that are included! Some tracks have a story of their own or were particularly important right from the start. For example having double-”Academy Award” winner Gustavo Santaolalla on board is a great honor. His contribution is an excerpt from his outstanding “Nanga Parbat” soundtrack. Personal highlights are also the “Laya Project”, which carefully reflects the cultural background of the Tsunami 2004 region, or the blissful “Carbon based lifeforms” piece – delivered by the excellent French Ambient label “Ultimae Records”. Finally I would like to point out that quite a few tracks and mixes are especially composed for this Liquid Sound compilation. Among them are “Ohm-G”, “Pan”, “Broekhuis, Keller & Schönwälder”, “Mirage of deep” and “Weathertunes”, who created a beautiful “coming home” after the journey. Can you tell us something about the collaboration with Micky Remann, the “Liquid Sound” initiator and cultural director of the Toskana thermal baths ? Did he influence your work? The LIQUID SOUND planning team constantly investigates innovations in the fields of audio, light, video, multimedia, Internet technology and event trends and tests their applicability with and to water. Communication and exchanges among different LIQUID SOUND baths ensures that each LIQUID SOUND installation harmonises and inspires the other. The spirit of LIQUID SOUND is dedicated to open artistic exploration of the medium of water. Water knows no limits to creative expression other than ones own imagination. Besides the world of music and Spa, LIQUID SOUND also has a root in interspecies communication. The original inspiration came from musical interactions with free Orca whales in the Canadian Pacific, initiated by US artist Jim Nollmann. After joining one of these journeys, German writer and media artist Micky Remann decided to pay tribute to the whales by opening up the experience of under water music to humans. LIQUID SOUND was born. People who now enjoy the soft and gentle underwater sounds are also encouraged to support the campaign for silent oceans, in order to stop acoustic pollution of the whales’ natural habitat.